Making a show for radio 4 on the history of diet fads [tonight Monday 24th at 8pm listen again here], I began to wonder what our modern gurus will come out with, when the cheques are all cashed, and the companies fold. Dudley J Le Blanc was a Louisiana senator in the 1940s, and the greatest quack ever to live. 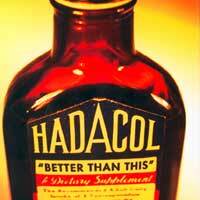 After a doctor cured his gout with a secret potion, Dudley stole a bottle, and copied the ingredients to make his own: Hadacol. “I had’da call it something”, he would later explain, once he had nothing to lose. Le Blanc made no medicinal claims, but pushed customer testimonials to an eager media. He appointed a medical director who had been convicted in California of practising medicine with no license and, indeed, no medical degree. A diabetic patient almost died when she gave up insulin to treat herself with Hadacol. Nobody cared. “It’s a craze. It’s a culture. It’s a political movement,” said Newsweek. Senator Le Blanc used Hadacol’s success to drive his political career, and his competitors, the Longs – descended from the democrat reformer Huey Long – panicked: in a moment of genius they launched their own patent medicine, and called it “Vita-Long”. Now, suddenly, it was a two quack race. I’m off to Scotland for the week, but I’ve set your programme to record so I can listen to it when I get back. It is interesting how this type of fraud has been going on for a long time and will surely carry on for a long time. Where there are the weak, someone will take advantage. I see modern energy drinks as a direct descendent of this kind of product, just with bubbles. Then again, in this country we used to have Bovril to “prevent that sinking feeling”. Anyway, I prefer Professor Longhair’s Hadacol Bounce. “stomach bloat”, that has a contemporary ring to it. I’m sure I’ve seen that feature in pro-biotic adds. This might not be the place to ask this but is there some other way to hear this show without the stain that is Realplayer getting on my PC? “Or if you’re a skinflint…” – yep. Will be reading that later this week.